Vancouver, British Columbia, December 6, 2018 (TSX Venture: EMX; NYSE American: EMX) - EMX Royalty Corporation (the “Company” or “EMX”) is pleased to announce the execution of a Regional Strategic Alliance agreement (the “Agreement”) between its wholly-owned subsidiary Bronco Creek Exploration, Inc. (“BCE”), and South32 USA Exploration Inc. (“South32”), a wholly-owned subsidiary of South32 Limited (ASX, LSE, JSE: S32, ADR: SOUHY). The Agreement provides annual funding for generative work and acquisitions over a two year period, as well as a framework to advance projects of interest. Generative work will focus on copper and other base metal projects within the Laramide and Tertiary magmatic arcs of Arizona, New Mexico and Utah. Projects advanced to the drill program stage may be selected as Designated Projects. 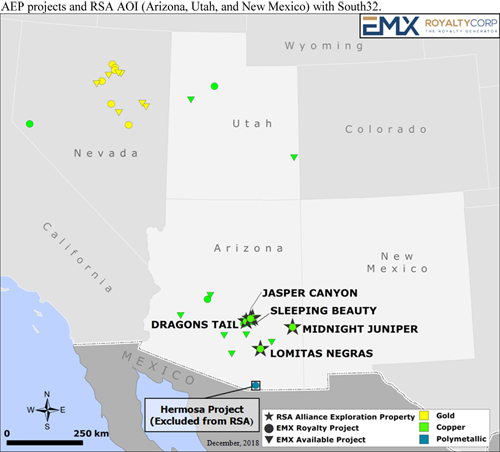 Designated Projects will advance under separate option agreements providing for work commitments and cash payments to EMX during South32’s earn-in period, and upon earn-in, a 2% net smelter return (“NSR”) royalty interest and pre-production and milestone payments to EMX’s benefit. 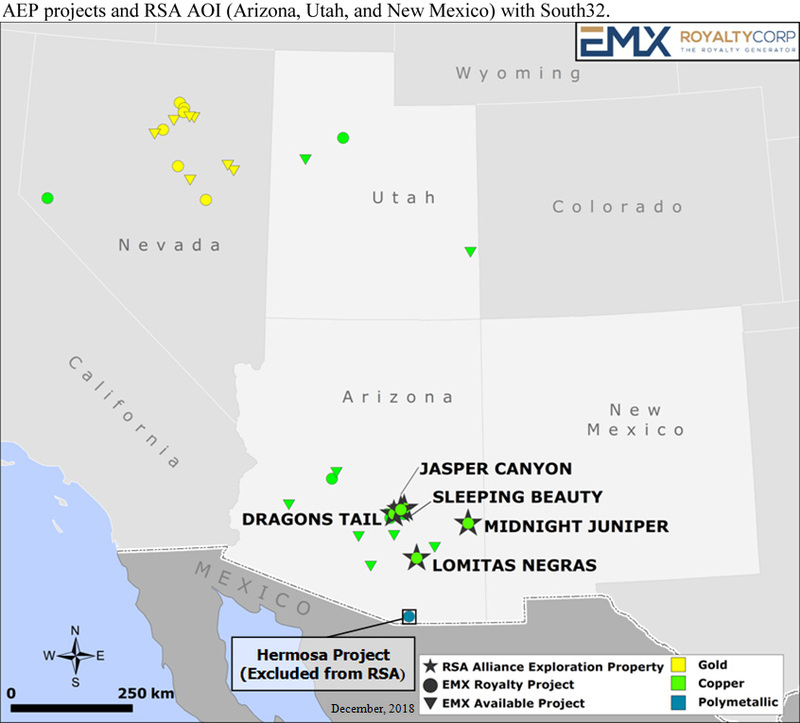 South32 has initially selected five EMX copper projects in Arizona to begin advancing toward the drill program stage. Please see the attached map and www.EMXroyalty.com for more information. Readers are cautioned not to place undue reliance on these forward-looking statements, which speak only as of the date of this news release or as of the date otherwise specifically indicated herein. Due to risks and uncertainties, including the risks and uncertainties identified in this news release, and other risk factors and forward-looking statements listed in the Company’s MD&A for the quarter ended September 30, 2018 (the “MD&A”), and the most recently filed Form 20-F for the year ended December 31, 2017, actual events may differ materially from current expectations. More information about the Company, including the MD&A, the 20-F and financial statements of the Company, is available on SEDAR at www.sedar.com and on the SEC’s EDGAR website at www.sec.gov.